Prime Minister reiterates his pledge to refute the 'slander and lies' spread by PA and Iranian leaders at UN plenum. 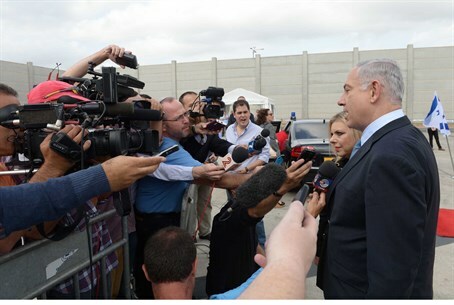 Speaking just before takeoff on his way to New York, Prime Minister Binyamin Netanyahu reiterated his pledge to "refute the lies" against Israel at the UN General Assembly. "In my speech to the General Assembly, I will refute the lies that are being told about us and I will tell the truth about our state and the heroic soldiers of the IDF, the most moral army in the world," Netanyahu said on the tarmac at Ben Gurion airport near Tel Aviv before boarding the plane. He was referring particularly to the Friday address by Palestinian Authority President Mahmoud Abbas, who accused Israel of carrying out a "genocidal crime" in its 50-day war against Gaza terrorists in a speech slammed as "offensive" by the US. Earlier, an official from Netanyahu's office called the Palestinian leader's remarks "an inciteful hate speech full of lies," with Netanyahu pledging to refute it along with claims laid out in the UN speech of Iranian President Hassan Rouhani. "After the Iranian president's deceptive speech and Abu Mazen's inciteful speech, I will tell the truth on behalf of Israel's citizens to the entire world," he said in a statement late Saturday, using Abbas's nickname. "In my UN General Assembly speech and in all of my meetings I will represent the citizens of Israel and will - on their behalf - refute the slander and lies directed at our country," Netanyahu said. Netanyahu will deliver his speech to the General Assembly on Monday, then will travel to Washington to meet US President Barack Obama at the White House on Wednesday.